Pawan Goyal is a student of Resonance since 8th standard. 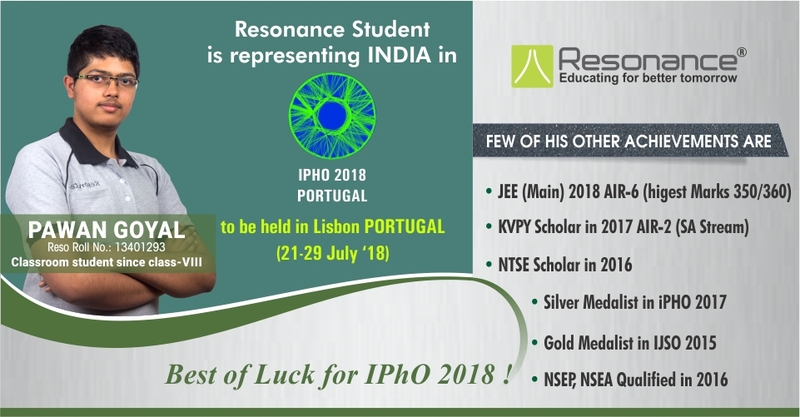 This year he will be representing India in the International Physics Olympiad (IPhO). This information was provided by Mr. R. K. Verma (M.D. & Founder of Resonance). He said, “IPhO (International Physics Olympiad) will be held at the capital of Portugal, that is Lisbon. The Olympiad will start from 21st July and end on 29th July, 2018. Students from various countries will showcase their talent and will give a strong competition to each other. Mr. R. K. Verma added, Pawan obtained highest marks 350 out of 360 in JEE (Main) 2018 and secured AIR 6. Last year Pawan bagged Silver Medal at IPhO. In the same year (2017), he secured AIR 2 in Kishore Vaigyanik Protsahan Yojana (KVPY). He also tasted success in National Talent Search Examination (NTSE), in the year 2016. He also qualified in National Standard Exam in Physics (NSEP) and National Standard Examination in Astronomy (NSEA) in 2016. In the year 2015, he bagged Gold Medal in International Junior Science Olympiad (IJSO).